Elijah the donkey lives with old Miss Benjamin on the beautiful island paradise of Barbados. Her donkey is a rascal and is constantly getting into mischief! When Elijah isn’t breaking into the kitchen to devour Miss Benjamin’s mouth-watering pumpkin cake or setting the house on fire, he’s off somewhere having the most wicked and amazing adventures. Can you imagine a donkey wearing sunglasses and water-skiing? Everything is possible in the delightful new children’s book Miss Benjamin Had a Donkey. Old Miss Benjamin lives on the beautiful and sunny Caribbean island of Barbados, in a small house, just her and her donkey, Elijah. Elijah is a very naughty donkey who wakes up each morning and wonders what mischief he can get up to that day. He likes to cause mayhem wherever he goes, and gets himself into a whole lot of trouble. From ruining Miss Benjamin’s new shoes, given to her by her brother for her 77th birthday to climbing onto her roof. Elijah and Miss Benjamin have a very strange relationship. They both seem to detest one another, and enjoy rubbing each other up the wrong way. Yet they both like one another’s company and they certainly bounce of one another with their arguments – yes the donkey talks! 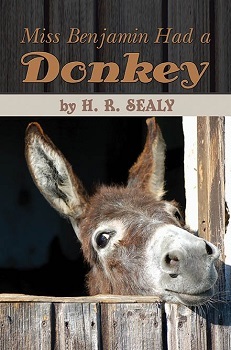 This a fun, children’s book that will have kids in awe at the things that Elijah gets up to alongside laughing out loud at the troublesome donkey. This isn’t one of those modern day children’s books, containing superheroes or fairies. This is a sweet, classic-style book that children will fall in love with, and can read time and time again. The story is comical from beginning to end and I can see adults laughing just as much as the kids will. A fantastic book, and I hope we see much more from Elijah. H.R. Sealy was raised in the Caribbean on the beautiful island of Barbados. As a young boy in school, he spent many a summer vacation goofing off on the beach, where he frolicked in the crystal-clear, blue tinted, Caribbean waters surrounding his island home, with mermaids and sea turtles. Upon entering his teens, he developed a passion for story telling and writing that only grew stronger as the years rolled by. This passion for writing eventually led to him publishing his first book for children; Miss Benjamin Had a Donkey. Which he initially wrote out of a desire to keep himself wake, whilst working the night shift as a Security Officer.